Think you’ve mastered the art of writing in a conversational tone? Try recording yourself reading your words aloud. You may discover that you’re not quite as conversational as you had hoped. Reading your words out loud is a great way to edit the work, and one of the revision strategies recommended in The Writer’s Process. When speaking the text, you approach it in a different way. You can uncover the potential traps that a reader might fall into while navigating a sentence. But it’s easy to cheat when you’re simply reading to yourself. I know I do. I skim over words quickly, and can easily be fooled by what I know the words mean. No one’s really listening, and it sounds fabulous in my own head. Bringing the reader/listener into the equation changes everything. That’s true whether the audience is another person or a recording device. When you find yourself stopping to explain something to your patient listener, or going overboard with vocal inflection to be sure that the sentence structure is clear – it may be time to revise. I pride myself on having a clear, conversational writing style, yet each time I record an audiobook, I discover that it’s not quite as conversational as I imagine. Sometimes the fault is in the choice of words. For the Subscription Marketing book, I use the word “subscription” frequently, sometimes stumbling over it while reading. The Writer’s Process refers many times to Mihaly Csikszentmihalyi. I had to practice saying that aloud many times before recording. But more often, the problems arise from complex or nuanced phrasing – things that work in my head when writing, but may become barriers for others when reading. 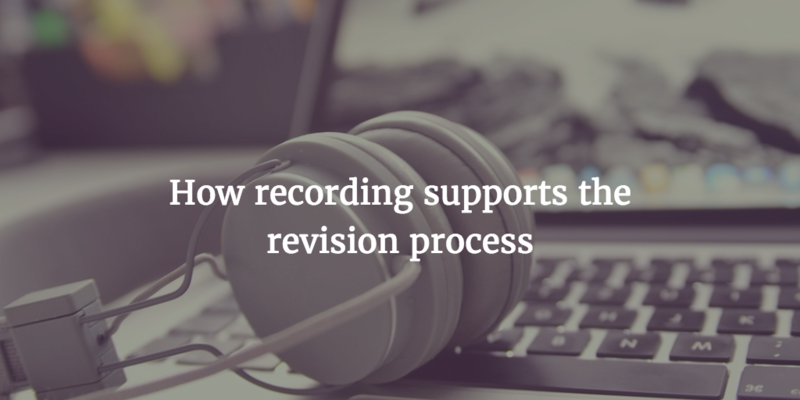 There are many reasons to record your words: you might turn a blog post into a podcast or other audio file, for example. Audiobooks are a wonderful way to expand the reach of books. But rather than thinking of audio solely as a distribution channel, consider using it as part of your editing process. In the past, I’ve recorded the audiobook versions of my books well after the initial publication. This time, I started recording before the revision and proofing was finished. While reading aloud, I found myself making many small changes to make the text more conversational. Give it a try for something you’re working on now. Read aloud to a recording device and check what you have done. Or find someone willing to listen to you read from the work. Do it with a pencil in hand, and notice when you have to stop, retrace, or otherwise explain the flow. Find the places you might lose readers (or listeners) and rework the text. Your readers will thank you.